In this video we will discuss, using data transfer object as the model in mvc. Please watch Part 28, before proceeding. Let's say the business requirement is such that, we want to display total number of employees by department as shown below. At the moment, either the Employee or Department class does not have Total property. This is one example, where a Data Transfer Object can be used as a model. Right click on the "Models" folder and add a class with name="DepartmentTotals.cs". Copy and paste the following code. Now add the following "EmployeesByDepartment" controller action method to EmployeeController class. At this point, build the solution, so that the newly added DepartmentTotals class is compiled. Now right click on "EmployeesByDepartment" action method in "EmployeeController" and select "Add View" from the context menu. 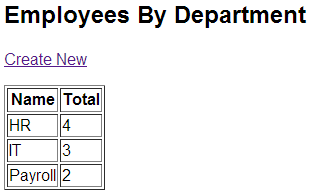 To list the employees in ascending order of total employee, use OrderBy() LINQ method as shown below. To sort the list in descending order use, OrderByDescending() LINQ method. As i have both the version of VS, i.e VS 2010 & VS 2012 in latest version mvc 3&4 are included by default so i think there is no need to install separately mvc 4. Dear Sir G you are doing a very good and outstanding job. Thank you so much Sir G!!! The model item passed into the dictionary is of type 'System.Collections.Generic.List`1[MvcDemo3.Models.Employee]', but this dictionary requires a model item of type 'System.Collections.Generic.IEnumerable`1[MvcDemo3.Models.DepartmentTotals]'. Exception Details: System.InvalidOperationException: The model item passed into the dictionary is of type 'System.Collections.Generic.List`1[MvcDemo3.Models.Employee]', but this dictionary requires a model item of type 'System.Collections.Generic.IEnumerable`1[MvcDemo3.Models.DepartmentTotals]'. Hello Sir ,i m getting an error while tring to create a DTO usin g code first EF ,its asking for Key ... plzz tell me how can i solve d issues ..plzz sir, upload a video by describing the DTO in details . "One or more validation errors were detected during model generation" along with "Entity type has no key defined". DepartmentTotals:: EntityType 'DepartmentTotals' has no key defined. Define the key for this EntityType. Departments: EntityType: EntitySet 'Departments' is based on type 'Department' that has no keys defined. DepartmentsTotals: EntityType: EntitySet 'DepartmentTotals' is based on type 'DepartmentTotals' that has no keys defined. Did you try building your project after adding the Key attribute? This error went away for me after building the project. Also, the Name property will not be added to the view when you generate the view, so you will have to add it manually. The SQL query is being executed by Entity Framework generated from LINQ you wrote.